Last November, I’d set CopyCon 2018 as my deadline to get the copywriting side of my business off the ground. I had just signed up to Kate Toon’s Clever Copywriting School so, at the time, it felt a bit ambitious. But I needn’t have worried. It turned out to be a genius move. CopyCon was Australia’s first copywriters’ conference and a highlight of my group membership to date. The support in the Clever Copywriting Community has been out of this world. There were so many things to learn when turning a passion for writing into a successful component of my virtual assistant services. Adopting new writing techniques for marketing copy, when I was more used to long-form writing, was just one thing. All of the business-y stuff was another story altogether! How was I going to handle this on my own? The nature of freelancing is that you are the only one doing all of the operational activities in your business. As well as service delivery, you are the whole management team. This can seem overwhelming. It was not until I’d connected with this fabulous crew of copywriters, that I realised I didn’t have to do it all alone. Bouncing ideas off each other, and sharing the highs, lows, and routine hard slog of it all, was the antidote to many of my business headaches. CopyCon’s insanely talented speaker line-up delivered on knowledge and tactics and reassurance that I’m on the right track. All of the e-books, webinars and “7-easy-ways” how-to blogs I’d read about small business and copywriting seemed insignificant compared to what I learned in a day among these incredible humans. Systems and processes – when you first launch, things can get messy very quickly. In the scramble to take on jobs, and set up accounting systems, it’s easy to get carried along by a chaotic momentum. Getting the processes sorted out so that regular tasks can be somewhat automated and take up less brain-space is key to taming the chaos. Kate, I hadn’t been making nearly enough use of your wonderful templates [link to copy shop]. I’ve added a few more to my copywriting toolbelt now. Editing – I often had trouble “letting go” of hard-earned passages, or what’s known as “killing your darlings”. Talking to others about how they tackle these frustrations, and picking up some sensible strategies for polishing up my work, was copywriter gold. Thanks Kelly Exeter for your thoughtful presentation. Giving myself time. This one is sometimes tricky to implement as the jobs I’ve taken on have been to tight deadlines. I’m no stranger to working well under pressure, and I’ll admit sometimes the last-minute rush is self-inflicted – procrastinating over a blank page is, after all, a copywriter’s superpower. But I might just surprise myself with what I could achieve given a longer lead-time. This was yours as well, Kelly. Delivering better-targeted services to small businesses. Not all copywriters are created equal. We each have our specialisations and talents – suited to different target markets. Identifying your ideal client and pitching directly to them is what we are all striving for, and the presentation on approaching small businesses was spot on. Thanks Jane Tweedy. Speaking of ideal clients, there’s nothing like surrounding yourself with the people you’d ideally love to work with. That can be clients, or collaborations with other freelancers and copywriters. The importance of being the “bouncers of our own businesses” was brought home in Robert Gerrish’s sage advice. 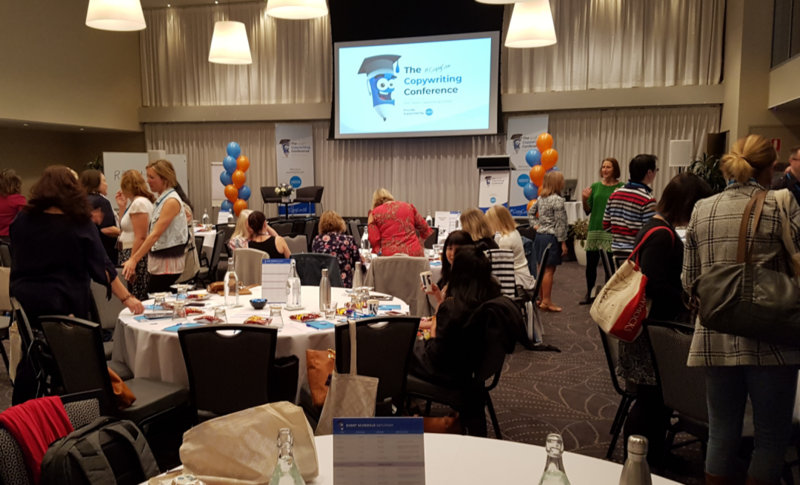 Attending Australia’s only copywriting conference was not only a feast of knowledge on the day, but it consolidated connections and friendships which had begun online months before. I am so full of respect, admiration and downright affection for this wonderful crew of copywriters. I am thrilled to have been welcomed into the best online community and appreciate every ounce of energy that Kate Toon pours into creating the incredible experience of the Clever Copywriting School. I’ve learned to apply process, serve clients, be bold! If you’re a keen bean and want to find out how CopyCon18 can help you master the business of copywriting, grab yourself a video ticket here and enjoy the wise and entertaining words of one heck of an incredible presenter line-up. I cannot wait until CopyCon19 when I’ll be re-connecting with the best copywriting friends I’ve ever made online and together we’ll “take our business to the next level” (that one’s for you, Kate).